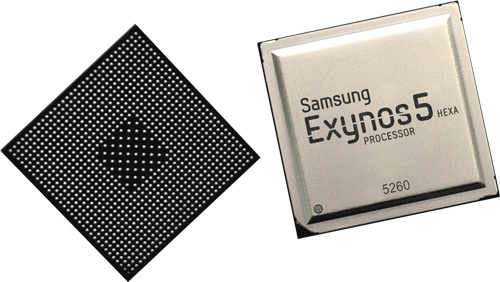 The Samsung Exynos 5260 or Exynos 5 Hexa is a midrange ARM based SoC for smartphones and tablets (mostly Android based). It integrates two fast Cortex-A15 cores and four power saving Cortex-A7 cores (ARM big.LITTLE). All six cores can (for a short period) work together to boost performance (GTS - Global Task Scheduling). Furthermore the chip contains an ARM Mali-T624 graphics card, a 32-Bit dual channel 800 MHz LPDDR3 (12.8 GB/s) memory controller, and an integrated video engine for H.264, MPEG4, and VP8 encoding and decoding (up to 1080p 60 fps). Thanks to eDP the SoC is able to drive PSR (panel self refresh) displays with up to 2560x1600 pixels.